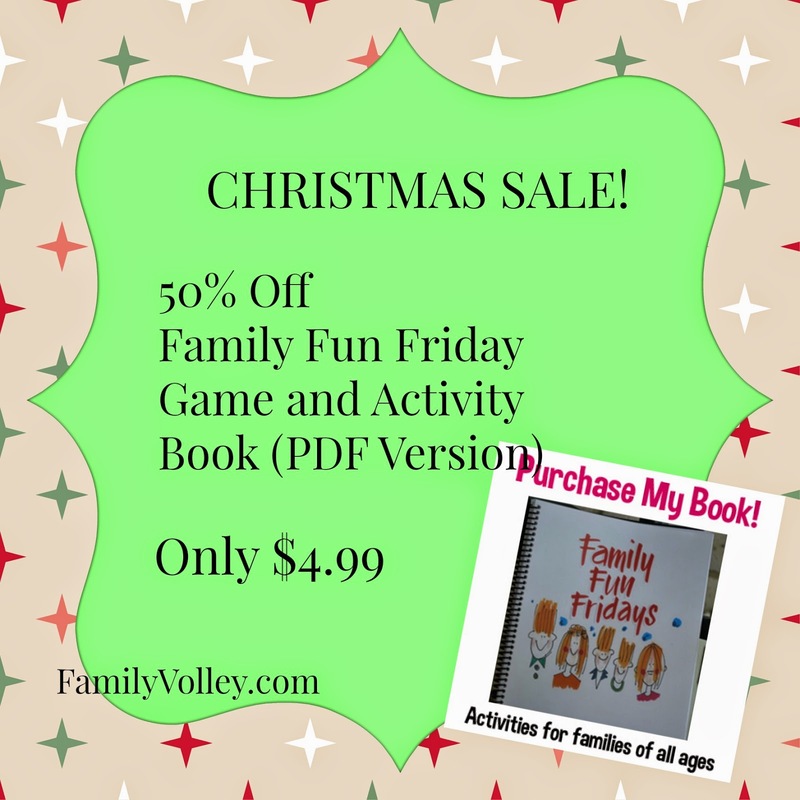 Family Volley: Christmas SALE!-Family Fun Friday Book!!!! Christmas SALE!-Family Fun Friday Book!!!! As a thank you for all your support and friendship, Family Fun Friday Game and Activity Book (pdf version) is on SALE for $4.99, from now until Christmas. That's 50% OFF. Featured on KSL Studio 5, The Matt Townsend Show, and numberous blogs and websites, families rave about Family Fun Friday's. $4.99 for over 90 pages of unique fun for your family. And remember, most games and activities use supplies that are already in your home and are perfect for families with members of all ages. Even your little ones and your teenagers will not only be able to play, but they will WANT TO PLAY! The sale is for the digital download which is perfect because it means you will have your book and all the amazing games and activities in time for your holiday celebrations with family and friends. Family Fun Friday's has never been sold for this price, so grab it quick and start playing with your family TODAY. Click here, or click on the red BUY THE BOOK tab at the top right of the page. Simply choose the pdf download version of the book and enter familyvolleyfun in the Discount Code box in the bottom left corner of the screen and the book is all yours. You and your family are going to love playing together! I loved your segment on Studio 5 today! I'm so going to incorporate some of those goals. Can I still buy your book with the coupon code? Hi Christy, thanks for watching today. Glad the goals were helpful. And yes, I will go in and extend the discount code. Click the link above and it will direct you to the store. Thanks! Is there any offer for this Christmas 2016 as it is around us and it would be great if you have something to share with us related to this offer? In this celebration time, I am happy to say that I am going to start my new job as a provider of cover letter service at CV Folks just after this new year celebration and I wish that this upcoming year will be more precious than ever for me and for you all. Merry Christmas in Advance. Woooow.. That's going to be a great experience for everyone to read it. It looks like a personal statement of the family. I would like the same, when I had my own family. Online education now provides a new learning system and higher courses which improve student’s knowledge and their skills for a wonderful job. When students can be completed their study at online UAE universities they got a valuable degree program and they easily got a job in a big company. I have to say i value the theme/structure of your site. Would you like to whenever keep working into any program similarity issues? Scarcely any my blog cultural event of onlookers have grumbled about my site website forget about working sufficiently in Explorer yet relatively turns up wonderful in Safari. Are you currently experiencing any ideas to help work out this problem? These kind of advances work extraordinary for those in a money related squeeze, however hurt spending plans when kept out longer than the first due date.